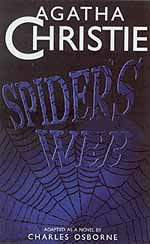 I had heard and read so much about Agatha Christie so I picked up one of her books from the library. I am just glad that I picked up this book,I just loved it. I was just glued to the book ,there is so much suspense and thrill and it is amazingly unpredictable. The crux of the play is the mystery behind the body Clarissa happens to find in her home and how she and her well reputed friends try getting rid of the corpse without informing the police just to avoid the nasty things which would follow after that as she was expecting her husband Henry with well reputed guest. All the thrill and mystery on why her friends agree to help her even though they knew this was egregious.The play is written so well in such unsophisticated language and its real thrill reading how the real coup is uncovered.